Luxury Portable Toilets by VIP To Go… Yes, Luxury! When you want luxury portable toilets that go beyond the simply necessity of providing a clean restroom facility and instead take your guests into the world of upscale luxury, you want to call VIP To Go! With VIP To Go you get multiple options, the most high end trailers, new models, customer service and good prices all rolled into one. When it comes to restroom trailers, VIP To Go is the way to go. If you are holding a high-end event, or an event that you simply want to give a high-end feel to it, a luxury Restroom Trailer can be a good option. At VIP To Go we can help you choose the most frills to impress your guests. At VIP To Go, our job is to take some of the stress of event management off your shoulders. We believe that you should not have to worry about, even think about, the luxury portable toilets at your event. Whether you are hosting a party, managing a community event or helping people in need, you have more important things to do than worry about restroom facilities. So let that be our job. At VIP To Go we will visit your site in advance to plan for proper placement of the trailer. 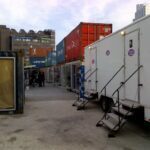 We will provide a clean, fully working trailer and all the supplies to keep it working throughout your event. We will always ensure that your trailer is properly set up and functioning, ready to meet – and surpass – all your restroom needs. And you will always be able to reach someone at VIP To Go if you have any questions or concerns. We can rent you extra trash cans to put around the restroom trailer or throughout your event, hire a restroom attendant to ensure your restroom never runs out of water, paper or other supplies and so much more. At VIP To Go our job is to anticipate your needs. One way that VIP To Go keeps you, our valued client, in mind is by ensuring your privacy and providing facilities with class. One way that we do this is by delivering all our restroom trailers in unmarked, white trailers. No advertising, no giant sign that tells everyone that this is a toilet. Just a simple, classic, white trailer for your guests to cool down, warm up, relax and refresh. At VIP To Go we offer unsurpassed luxury. 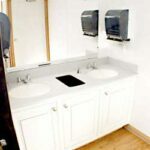 Among the extras that you can have in your restroom trailer are the following: a working electric fireplace, music, television with DVD, baby changing table, air conditioning or heat, a concierge, and wireless internet surrounding the restroom trailer. And we can take the luxury, and the look, even further if you want. We offer red carpet service where we, literally, roll a red carpet down the luxury portable toilets steps and onto the sidewalk or grass to welcome your guests. We can even place potted palm trees around the trailer to help it blend in and add an additional layer of style. Whatever you need, VIP To Go is there for you. For more information about our luxury portable toilets browse our website or call 877 564 6977. There are five great reasons why your wedding restroom rentals should come from VIP To Go. We offer selection and value, but so much more. VIP To Go is a long term bathroom trailer rental company that just happens to do short term rentals. One weekend or six months, we have you covered. Restroom trailers are far superior to traditional portable toilets. They offer cleanliness, comfort, convenience and even luxury. That’s right, we said luxury. LCD TVs, DVD players, fireplaces… stay tuned to this VIP To Go Restroom Trailer guide to learn how you can impress as well as accommodate your guests if those features meet your needs.